A farmhouse is something I think a lot of people aspire to, whether it’s a big Georgian building a hundred years old or a modern prefab or modular tiny house. Here’s something kind of in the middle. It’s a new design, but the look is somewhat classic. It’s called “Holly Ridge Farmhouse” and it was designed by Sala’s Marc Sloot (and photographed by Troy Thies). The Kitchen design was done by Sloot teamed with David Heide Design. And the building was built by Cates Fine Homes. Actually, this design won an award, the A|A Home of the Month. The home designers were going for a peaceful and natural impression with this one. While the house is small and practical — well, not that small, not like a tiny home or any of the small prefabs we’ve been looking at recently. This one’s just over 3,000 square feet, inluding 1,000 of basement, and it’s a 3 bedroom home with 2 bathrooms, that open porch you see in the photo, and a screen porch. 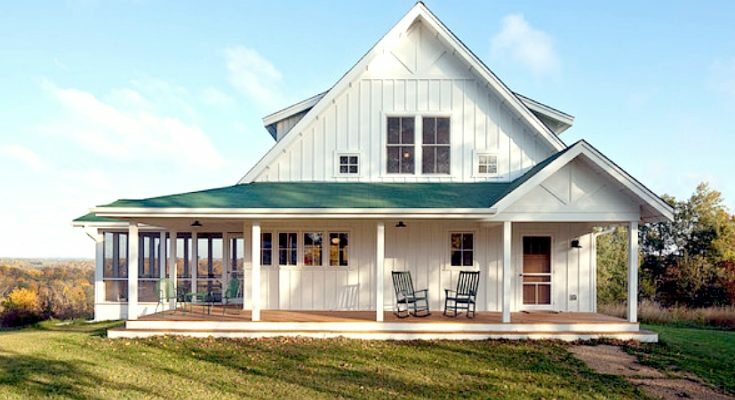 But in addition to its basic practicality, it’s a calming, invigorating, picturesque home design, made for farms, and it’s about the right size for small families, empty nesters, and is still big enough to have family and friends come over and visit. This house is also eco-friendly. It got a Wisconsin Green Built Home certification. To see more of Sala’s work, find them in the Building Homes and Living directory.